There are only a few hammered dulcimers which cover exclusively the bass range. 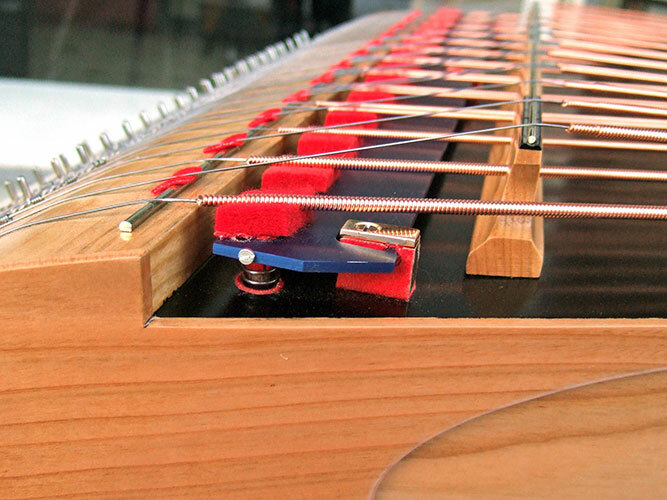 The concert bass hammered dulcimer, used as an accompanying as well as a solo music instrument, imparts undreamed-of dimensions to musical expression, which are additionally augmented by the pedal damping and the electronic sound pickup. There are different kinds of wood as well as different colors for all aluminum parts to meet all individual tastes. Particular attention is attributed to the professional and individual production of strings. Specialized equipment for wrapping strings was developed in-house. SaitenArt offers various models of bass hammered dulcimers and also realizes special requests.